In June 2016, Hitachi and Kyoto University established the Hitachi Kyoto University Laboratory (hereinafter referred to as the "Hitachi Kyodai Lab"), a joint research body for exploring the societal issues of the future based on the idea of pursuing inquiries into fundamentals and theory founded on an understanding of people and culture. In September 2017, Hitachi and Kyoto University jointly made policy recommendations aimed at a sustainable future for Japan. Humanities and social sciences experts and information science researchers used artificial intelligence (AI) to render 20,000 different future scenarios for Japan. This harvest yielded compelling suggestions on how to configure a society for a happy future. 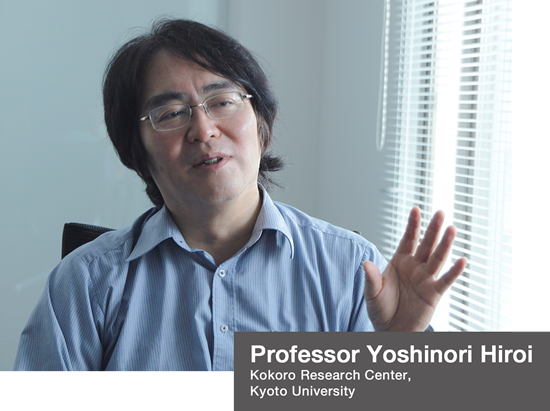 Professor Yoshinori Hiroi of Kyoto University's Kokoro Research Center approaches his studies of the current state of Japanese society from a variety of angles. Over the course of his research, he has developed concerns about the potential sustainability of Japanese society, leading to his resolve to discover prospects for Japan's future. At Professor Hiroi's initiative, Kyoto University and the Hitachi Kyodai Lab began using AI to construct future scenarios. 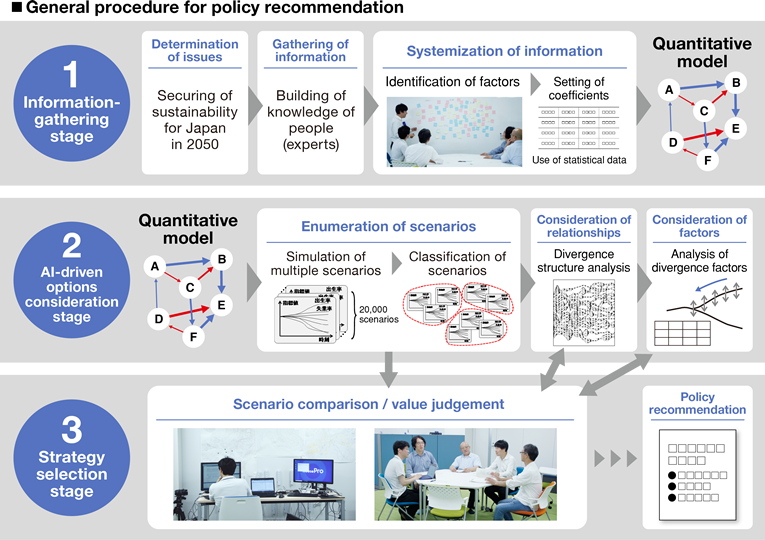 The combination of Kyoto University's knowledge of social design and policy issues and Hitachi's AI technology resulted in the rendering of 20,000 future scenarios. Further classification and investigations also discovered that about 8 to 10 years from now will see the occurrence of a divergence point that will decide the sustainability of Japanese society. Having deduced guiding principles to be acted on in order to realize a sustainable vision of the future, Hitachi and Kyoto University made policy recommendations. Verification through regional-level social testing has commenced and will be applied to future policy-making. "As the national debt increases, income disparity continues to expand. And with the younger generation facing worries about their future, the birthrate is likely to fall even more. We must recognize that if we go on like this, we put the sustainability of Japanese society at considerable risk. Something must be done, I thought. Just as all this was occurring to me, the Hitachi Kyoto University Laboratory came on the scene." As it happens, Professor Hiroi and members of the Hitachi Kyodai Lab were previous acquaintances. 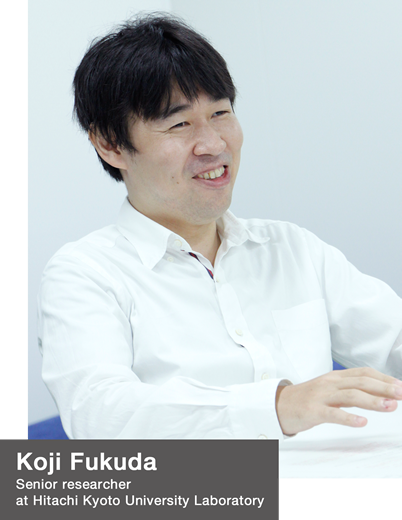 While still holding his previous position at Chiba University, he gave lectures at Hitachi's Center for Exploratory Research. 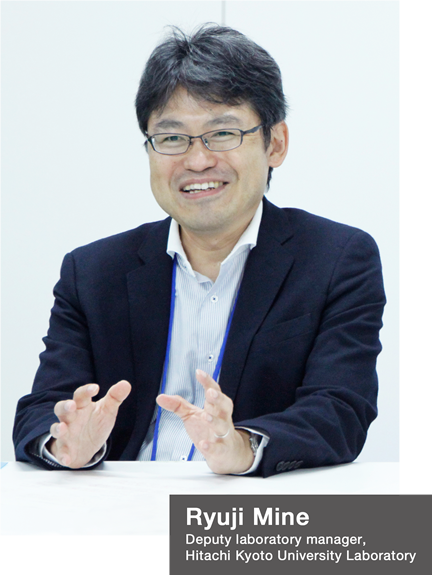 According to Ryuji Mine, deputy laboratory manager of the Hitachi Kyodai Lab, it was listening to his lectures that inspired members of the Hitachi Kyodai Lab to consider bringing together humanities, social sciences, and information sciences. Mr. Mine states that "While speaking with Professor Hiroi on various topics and inquiring into his awareness of issues, talk about joint research involving other professors and researchers naturally arose. I have always wanted to develop AI technology for assisting people in decision-making, but upon gaining access to Kyoto University's unique network, this grew into the grand idea of policy recommendation." Fostered by various discussions on how to contemplate Japan's future in 2050 between Kyoto University experts in humanities and social sciences and Hitachi information sciences researchers, this project is gradually getting off the ground. "The most-important point at issue in discussions with the academics was how to apply AI. In our own studies of the social sciences, we understood that policy recommendation decision-making went forward from information-gathering based on the three steps of object modeling, option considerations, and strategy selection. In ordinary applications, AI is used in the process of analyzing mass amounts of gathered data and extracting and modeling relationships that escape human notice. However, when it comes to 30 years in the future, the currently existing data is insufficient for a complete rendering. So, when I proposed to the academics using a new method of AI application to comprehensively simulate the various possible futures that could occur, 'Let's do it!' they cried, and I got their agreement." "Population, finance, regions, environmental resources, employment, income disparity, and other quantitative indicators are not enough for the essential pursuit of a sustainable future society. We also need to take into account subjective factors such as health and happiness. Although we were concerned that incorporating and processing ambiguous subjective factors as parameters might prove problematic, Hitachi's AI was capable of incorporating such ambiguous factors as these in making simulations." The work of incorporating and modeling ambiguous factors began with identifying social factors that affect the future. Four researchers at Kyoto University were able to come up with 149 keywords comprising not only quantifiable indicators such as declining birthrates, environmental destruction, gross domestic product (GDP), and unemployment rates, but also qualitative indicators such as "feeling of happiness" and "richness." These were posted onto a whiteboard and examined for inter-indicator causal relations. Looking back on the process, Koji Fukuda, senior researcher at the Hitachi Kyodai Lab, recalls that "Connecting positive and negative causal relations with arrows brought to our attention the existence of influences between seemingly entirely unrelated factors that otherwise would never have occurred to us, and it cracked the door open for a glimpse into the mind of an expert. It was a time full of thrilling intellectual stimulation." The Club of Rome: The Club of Rome is a private organization with world-famous business people, politicians, and scientists as members. The book The Limits to Growth, published in 1972, reported that if population growth and environmental pollution continue, growth will reach a limit. The way the identified social factors interact was systemized to build a model for conducting AI simulation. The presentation of future options based on this model highlights the power of AI in delivering superb performance in the listing of unimaginably extensive possibilities. "These 23 groups were of generally two types: urban centralized and regionally dispersed. Urban centralized refers to futures in which everything concentrates in large cities like Tokyo that somehow maintain financially sustainability, but which suffer accelerating population declines and expanding income disparity while health standards and levels of happiness fall. Regionally dispersed refers to a future vision in which people disperse and carry out their lives regionally as income disparity shrinks, while the economy runs correspondingly effectively. When we evaluated the year 2052 state of each scenario group from the eight perspectives of population, finance, regions, environmental resources, employment, income disparity, health, and happiness, it was determined that the regionally dispersed type had the highest sustainability." Results of the evaluation of representative 23 scenario groups from eight perspectives; in scenario groups 1 to 4, the population regionally disperses and the regions revitalize, generating high evaluations for all parameters, including population growth from an increasing birthrate, shrinking income disparity, and rising individual levels of happiness, etc. 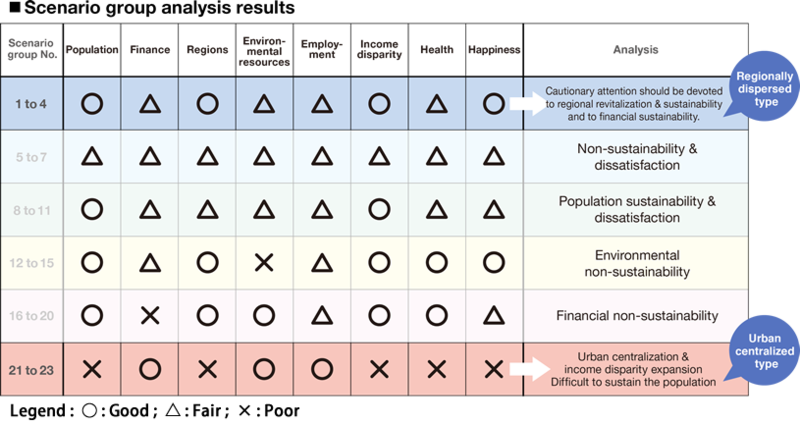 In contrast, scenarios 21 to 23, which have "×" (poor) ranking in the regions category, exhibit an urban centralized type in which finance, environmental resources, and employment rise, but all other factors rank "×." This simulation features one more point of interest: the timing of scenario divergence and its related factors. Scenarios arriving at either urban centralized or regionally dispersed diverge as the time axis advances. Firstly, 8 to 10 years into the future they reach a large divergence to either the urban centralized or regionally dispersed type. From this point on, there is never an intersection between two scenarios. This suggests that Japan's future general direction is likely to be decided in 8 to 10 years. Also, in cases in which a scenario progresses to regionally dispersed, in 17 to 20 years from now, non-sustainable finance and environment scenarios diverge. Unless the necessary policies are executed by this time, Japan after 2050 will come to experience a drastic deterioration of finance or environment and will become susceptible to non-sustainability. According to the lab's Deputy Laboratory Manager Mr. Mine, "AI allowed us identify groups of indicators effective in leading to desirable scenarios in terms of when and in what order each scenario's divergence would occur. Based on these, our academics put together social measures they needed to tackle and, in this project, gave shape to them as policy recommendations. Recent politics demand evidence-based policy-making, so I think that our scenario technology, which provides such clear evidence, is highly serviceable. Going forward, we need to work on repeating simulations and raising their accuracy." Series of procedures leading to policy recommendation; at the options considerations stage, AI technology is used to perform simulations and analysis, followed by the enumeration of the tremendous number of scenarios and considerations of inter-scenario relationships. In September 2017, Kyoto University and Hitachi jointly announced a series of research results in the news release titled, AI-derived Policy Recommendations Aimed at a Sustainable Future for Japan. Recommended, for example, are such measures as environmental taxation and full-scale deployment of public transport as policies intended to lead to a regionally dispersed scenario. A video depicting a simulation of Japan's future divergence reverberated with such impact that inquiries from as many as 60 nationwide regional governments were received. "One of the future challenges we face is the refining of the simulation model through repeated verification testing. One example is, in the case of Nagano Prefecture, how should we simulate the pluses and minuses of opening a linear bullet train line? The capabilities of the Hitachi Kyodai Lab will be indispensable in contemplating the future." The Hitachi Kyodai Lab is planning to provide local governments nationwide with simulation technology as software package at no cost. "The Hitachi Kyodai Lab is planning to pursue activities in collaboration with Professor Hiroi and is currently in the process of setting up a framework for that purpose. Previously, we as AI researchers have considered people as biological beings that are parts of a mechanism. I am now deeply impressed with the need to look at people from the viewpoint of society, which will allow us to collaborate with Professor Hiroi in finding solutions to the challenges of future society. And, with regard to a method of applying AI for contemplating the future, I feel that we succeeded in establishing one such model in this project." After the announcement of policy recommendations, efforts with regional governments began, starting with Nagano Prefecture.